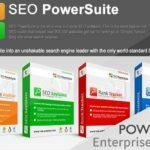 The SEO PowerSuite is a combination of four of the most commonly used tools in online marketing, Rank Tracker, Website Auditor, SEO Spyglass and Link Assistant, all from Link Assistant. This software brings together all these different tools under one roof, providing the user with easy access and convenience. It has tools which enable the user to manage the most complex components of one’s SEO program. It features resources that can be useful in optimizing keywords, building links and analyzing the competition. Furthermore, it gives results with very detailed descriptions and reports. Small business owners who are entering into the SEO field might sometimes find it overwhelming keeping track of the numerous small details of a good SEO campaign. However, with this tool, that process has been streamlines, with all the different elements under one roof. The most impressive aspect of SEO Powersuite’s work is keyword optimization. This tool has a powerful keyword suggestion tool which gathers data from both WordTracker and Google Adwords. Both WordTracker and Google Adwords are top industry tools, used by many to find site appropriate keywords. This suggestion tool also provides an unlimited amount of keywords and related keyword phrases. With a high number of keywords to choose from, there is a high chance of finding just the right one that matches the needs of the business. it also provides additional tools with which one can sort through keywords and keyword phrase suggestions it generates. For instance, it has a tool that estimates the number of visitors a keyword will bring to the site with a number one ranking on that keyword. With this information, one skips the trial and error involved in selecting the right keyword, and understands the keywords that will work and those that will not. Link building and management is another important SEO Powersuite’s capability. The building and management of backlinks requires a lot attention to detail. With SEO Powersuite, though, one is walked through the step by step process of developing an SEO campaign based on competitor research. With the Spyglass tool, one can dig through backlinks in search engines and find relevant and reliable links for one’s site. Although they are not as in depth as other tools in the market, the information they provide is just as useful. 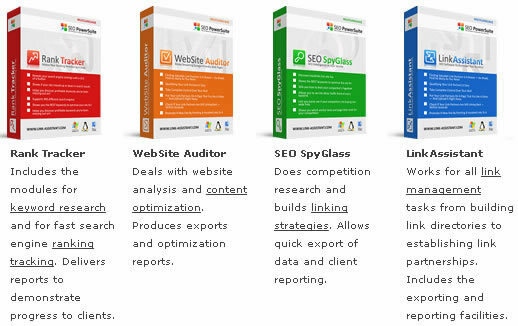 With the Website Auditor tool, competitor analysis is easy. You can keep up with the progress of a competitor’s optimization and link building efforts. This tool evaluates one’s top ten competitors, allowing direct comparison with them. With this information, it is possible to fine tune one’s campaign and gain an advantage. It pulls information from competitor link building and site optimization, and integrates this information into useful suggestions that one can use to get ahead. The social media tracker also provides information from the most popular social media sites like Facebook, Twitter and Google Plus. It also has a useful help and support feature, although it does not have the typical live chat option or forum blog that many are so used to. The company website, however, has a page dedicated to answering any questions that users might have. A link assistant is very important in SEO for it enables one to link their sites with others link directories on the internet. These directories will allow you to connect with other sites that have a high amount of traffic and in return, they will put some other site’s link on yours. That way, you get a very good traffic. Link assistant helps in taking your links to websites that have content of a similar nature to yours and this assists website owners in finding the right traffic for their site. It would be very hard for you to look at the performance of your page from every Google page that you are opening. Therefore, through the use of SEO ranking software that is provided by SEO Powersuite, you are able to know the performance of your website on search engines right from one page. This is very important for it can enable users to know where their website stands online. From there, they are able to make the right decisions when doing their optimizations. Another pro of SEO Powersuite is the availability of SEO spyglass which is software that monitors keywords, phrases and anchor text frequencies. With this, you are able to know how your site is performing along with the most popular keywords to use in your postings. This helps SEO users in making their websites more visible. 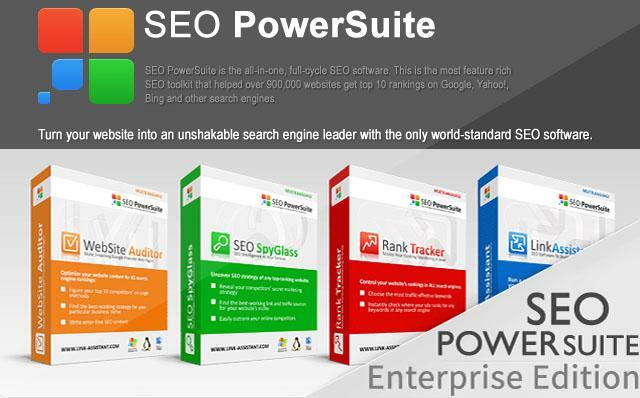 Unlike other SEO programs in the market, SEO Powersuite has proved to be very easy to use. It has features that one can understand with ease even when you do not have an experience in using the software. The makers of Powersuite have ensured that they have used a simple language so as to enable people to understand instructions and links. As a result, many people have been able to adopt the use of SEO Powersuite. Unlike other SEO mangers on the market today, use of SEO Powersuite proves very effective for it can enable users to see keywords that are doing well, manage their sites and note weaknesses. Powersuite presents users with an interface that covers all data relating to your website. From the number of visitors that are coming to the site to the rank of the site on the search engines. They all play an important role in helping you manage your SEO. SEO Powersuite has very little cons. However, some users have reported that they are not able to access some parts of the program. Nevertheless, this has been solved.